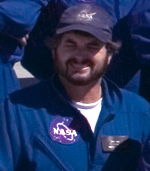 Eric James is a member of the NASA Ames Video and Graphics Branch (code JIT). He is an experienced videographer, editor, and film maker. Purpose of the Video and Graphics group is "to provide a full range of support services on site for all kinds of video needs here at the Center." James has provided video support during past Leonid MAC missions and the Genesis SRC Entry observing campaign in collaboration with Ed Schilling. HDTV camera equiped as a slit-less spectrograph during the Genesis SRC Entry observing campaign. James performs High Definition TV imaging and slit-less spectroscopy in support of outreach and science. The High Definition TV imagers are used both for imaging and optical spectroscopy.